"Thanks so much for your detailed reply. My dealings with you a couple of years ago were also top notch. Your oven is so much better than others I have come across. I consistently get 460C in mine for pizza where others seem to top out in the mid to high 300s. It also retains the heat so well I often do a slow cook roast the next day after a pizza night." Brendan Sawford. Melbourne. "The oven is fantastic and has had great use. Our pizzas come out perfectly with a crispy base after 4 minutes on average. Lately we have been making Turkish pizzas which get rave reviews from our guests. We congratulate you on such an excellent product." Geoff and Rose Dickson, Bellbowrie, Qld. "Just a short note to thank you for our pizza oven. We've cooked pizza, roasts and bread thoroughly enjoying the process and more importantly, the result! Your availability to consult via phone re minor detail was greatly appreciated." Peter and Janet Jackson, Bairnsdale, Vic. "I am delighted to advise that we have completed the pizza oven. We invited our family and friends for Xmas dinner. I successfully cooked 15 pizzas and also included roast pototoes. The guests all agreed they were the best pizzas they ever tasted. Attached is a photo of my pizza oven that I am proud to share with you. Much appreciated! " Gary and Rhonda Mackellin, Melb. "One thing about the wood fired oven cooking is that the options appear to be endless, all good fun and scrumptious eating - I am amazed with the length of time your oven holds temperature after the fire has gone to coals. Thanks again for introducing us to wood fired cooking in your fabulous oven." Al and Carol, Bolwarra Heights, NSW. "Thanks for your oven, I am very impressed. I've cooked everything from fish, roasts, wings, steaks, pizza in my first four cooks and everything has turned out perfectly. Your helpful hints with assembly and cooking were very valuable and I had it finished in no time." Mark Sherlock, Nowra, NSW. "It looks fabulous. You thought of everything, very pleased to find the paddle, brush and even the alfoil. It is a fantastic kit." Alison MacEwan, Mt Eliza, Vic. "Had several pizza nights, a couple of roasts and just finished eating the best smokey BBQ ribs of all time! Thanks for everything." Craig Pudney, Baldivis, WA. "We did a folk festival last weekend and sold 350 pizzas, our best yet." Ian Fisher, Pizza Fresco, Townsville. "We're very happy with it, once a week I fire it up to bake bread for the week, and we would use it as well for roasts etc." Volker and Brigitte, Vermont, Vic.
" Fired it up and first time we tried pizza's. Fantastic. " Spiro Kemertzis, Townsville. "The public are "Lovin the Oven" on the trailer, I'm running the oven at full capacity 6 nine inch pizzas at once and pumping them out every 4-5 minutes. When people order a pizza I say 4 minutes your pizza will be ready, that just blows them away." James, "Oven Lovin" Mobile Woodfired Pizza, Sydney. "l just finished a 3 day festival and pumped out about 200 pizzas." Jason, Youpizza Mobile Woodfired Pizza, Sydney. "Don, please add this feedback. We have had 4 cook ups so far- 3 pizza nights and one experimental roast, and the food is just amazing. The family and neighbours love it. Well done on great service and value." Pat Laurence, Adelaide. "We are loving the oven- as are our friends and relatives! Have made about 100 + pizzas so far and had our son's 21st pizza party which was a great hit with his friends" Ruth and Tony Logan, Toowoomba. "Our guests are loving it! Cheers, bloody fantastic." Will and Suzette, Cedar Cottage, Rockingham WA. "Fantastic oven! Had soooo much fun making it. Cooks beautifully-what a great addition to our verandah! With thanks Don, pleasure doing business." Jacqui Cameron, Surat, Qld. "The verdict on the pizzas? Unbelievable, spectacular, superb. There were 17 of us!" Kay and Terry Vinson, Kenthurst NSW. "It is great, we can fit up to 5 pizzas at a time. The Tandoori Chicken pizza sells really well." Sue Mitchell, Royal Hotel, Drouin, Vic. "Very happy with the design, goes together very easily." John Difazio, Barrack Heights, NSW. "Your wood fired oven is proving to be a great drawcard to Mooloolah Valley Holiday Houses." Atalanta, Qld. "The pizzas are great, we fed 30 kids in a couple of hours and it was a lot of fun." Ken Thomas, Seaham, NSW. "We are so happy we got it and it has been a hit with family and friends." Natasha Mardero-Magree, Darwin. "We have already used it a couple of times and it is fantastic." Nicole, Wytaliba, Glenn Innes, NSW. "A pleasure doing business Don." Ken Thomas, Albany, WA. "Overall the oven is brilliant and everyone that's seen or eaten out of it loves it." Tony Pattman, Sydney, NSW. "We're very happy with the oven, we even cooked a decent size snapper in there." Cliff McGillvray, Kalamunda, WA. "Very happy with the investment". Geoff, Samford, Qld. "Have received many compliments about the oven." Colin and Lee-Ann, Dianella, WA. "We have cooked pizzas, a few roasts, chicken wings, meat balls, lamb cutlets, nachos...Thanks it's great!" Justin and Cressi, Colac, Victoria. "So far cooked pizzas, 2 roasts, chicken wings, garlic prawns and even some biscuits. It's been a big success and we love it". Scott and Therese, Thornlie, WA. "Thank you so much for your help, you made it so easy". Ron and Lesley, Mundaring, WA. "Thanks for such a good job conducted with such goodwill." Stefan and Donna, Alexander Heights, WA. "Oven is GR8..really happy with it." Mr SunnyJim, Bundaberg. "The oven is brilliant. We have used it several times and the pizzas are REALLY GOOD." Tania Webbern, Gold Coast. "We absolutely love the pizza oven...Friday nights are family pizza nights! Craig and Rachel, Nicholls, ACT. "Friends and neighbours seem to be coming around more often and we've put on weight! That's how good it is!" John and Karen, Atwell, WA. "I have to compliment you on the packaging, you did a terrific job. I appreciate the level of communication, it helps significantly when buying interstate". Peter and Liz, Phillip Island, Vic. "We have just had the official 'christening' of our pizza oven and we are extremely happy with it." Glenn Dwyer, Samson, WA. 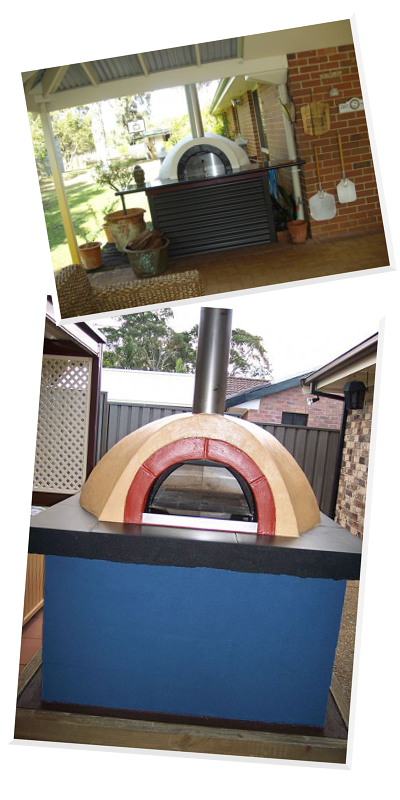 "Finished the pizza oven and gave it a workout on the weekend and it worked a treat". Mark Simmonds, Nowra, NSW. "All goes well with the pizza oven. It's fantastic" Andrew Evason, Beldon WA. "The oven is awesome - our friends really enjoy coming over for dinner and we have had a couple of big work events too." Craig Pudney, Baldivis, WA. "I was very happy with the service and advice you gave. It was a pain free exercise from start to finish! The total silence from the kids when we have cooked in the oven is worth every cent!" Rob Mihalyka, Canberra.